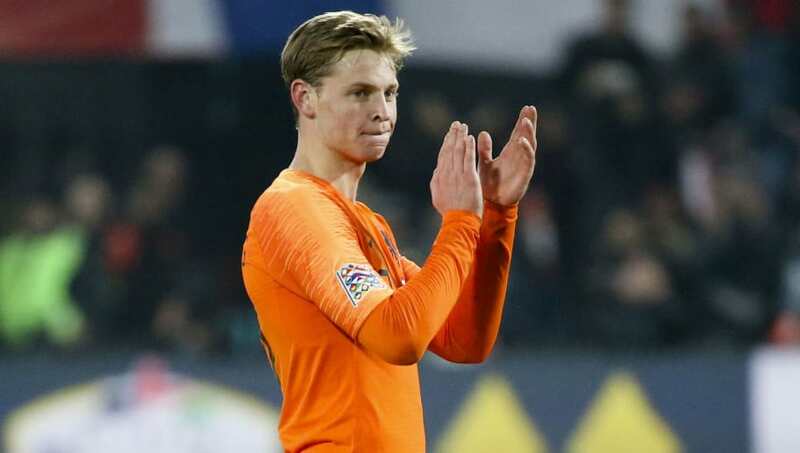 ​Dutch midfielder Frenkie de Jong has revealed that he would like to continue wearing the number 21 when he moves to Barcelona next season, but he is uncertain as to whether he will accept Nike's request of playing with his forename on the back of his shirt. The 21-year-old was one of the most in-demand prospects during the January transfer window, but eventually secured a £65m move plus add-ons to Camp Nou which allowed him remain with Ajax for the remainder of the 2018/19 season. Speaking to Dutch outlet ​Het Kontake, de Jong revealed his desire to keep his current shirt number of 21, but he is yet to decide which name he will request on the back of his ​Barcelona shirt, despite Nike's preference that it should be 'Frenkie'. He said: "In July I sign my official contract in Barcelona and I am also being presented to the fans and the press. Playing with [the shirt number] 21 would be nice, because that is sort of my number. The selection for the new season is not yet known so I will have to wait. "There is also thought about playing with Frenkie on the back. Nike prefers that from the point of view of merchandising. I'm not sure if I want to." Currently, the number 21 shirt is vacant at Barcelona, with Andre Gomes having worn that shirt before his loan move to ​Everton last summer. De Jong also admitted that moving to Barcelona has always been his 'dream', while suggesting he may never change clubs again if they move goes well. He said: "It's all very nice what happened in the past year, and it went fast too, with Ajax, with the Dutch squad and now as the most expensive Dutch player in Barcelona, but I should not dwell on it for too long. Enjoy, but stay hungry and keep improving myself. "Barcelona is also the ideal club. Barca has always been my dream, just like any boy I wanted to play at the Camp Nou. I have a good chance of playing time and can learn a lot, possibly even faster than at Ajax, and the game also matches my way of playing football. "Initially the interest went through my agent, who talks to the clubs. When it became more serious, I came in. Paris Saint-Germain was a good option, but Barcelona has always been a dream, and I'm happy with my five-year contract. ​"If I succeed, then the chances are that I will never leave, just like [Lionel] ​Messi."